What if the Lady of the Lake wielded Excalibur instead of King Arthur? Frank Miller and Tom Wheeler answer this question in their upcoming Young Adult novel Cursed, which follows 16-year-old Nimue as she battles “armies of a corrupt king.” Illustrated by comic book writer/artist Miller (The Dark Knight Returns, Sin City) and authored by writer/producer Wheeler (Puss in Boots), the novel serves as a companion book to the pair’s Netflix series of the same name. Netflix’s Cursed will debut in 2020 and stars Katherine Langford (13 Reasons Why) as Nimue. Miller and Wheeler are serving as co-creators and executive producers on the show. Whosoever wields the Sword of Power shall be the one true King. But what if the Sword has chosen a Queen? Nimue grew up an outcast. Her connection to dark magic made her something to be feared in her Druid village, and that made her desperate to leave. That is, until her entire village is slaughtered by Red Paladins, and Nimue’s fate is forever altered. Charged by her dying mother to reunite an ancient sword with a legendary sorcerer, Nimue is now her people’s only hope. Her mission leaves little room for revenge, but the growing power within her can think of little else. Nimue teams up with a charming mercenary named Arthur and refugee Fey Folk from across England. She wields a sword meant for the one true king, battling paladins and the armies of a corrupt king. She struggles to unite her people, avenge her family and discover the truth about her destiny. 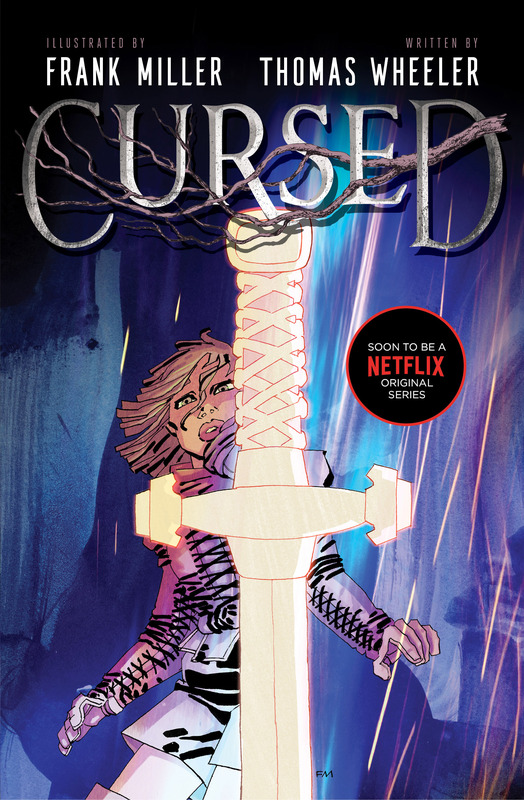 Simon & Schuster Books for Young Readers will release Cursed on October 1st, but now you can get an exclusive first look at the cover designed and illustrated by Miller! 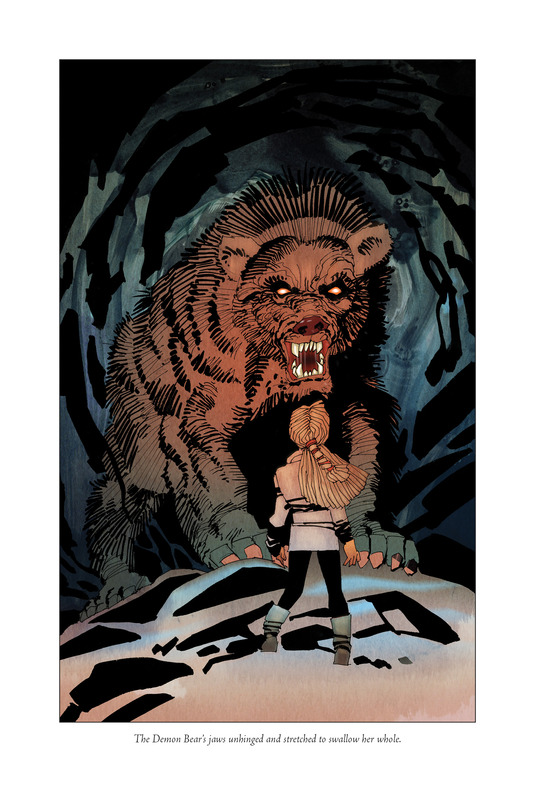 Cursed also features interior illustrations by Miller, like this one capturing Nimue’s encounter with a Demon Bear. You can read an excerpt from the novel below, and Cursed is available for pre-order here. Nimue awoke with a start to piteous cries. How long have I been unconscious? she wondered, her thoughts sticky and slow. Jolts of agony forked across her skull, and her hand went to a wet patch of hair and a knot just below her left ear where the iron ball had struck her. Numbly, she pulled herself from the woodpile and took in the chaos: village elders roasting on fiery crosses, red robes everywhere, children crying in the mud, every village hut aflame, dogs sniffing dead bodies in the road. A guttural cry of “Mother!” ripped from her throat. She charged across the road, skull throbbing, racing past bodies and toppled carts. Almost immediately, a Red Paladin took hold of her cloak, but Nimue twisted and it tore free into the paladin’s hands. Nimue lunged onto the hill, the Red Paladin in pursuit. She ran past charred bodies on the crosses, their limbs twisted. The paladin stumbled behind her, and Nimue created some distance. She sprinted into the Iron Wood, dodging between trees until her boots landed on the well-worn stones of the Sacred Sun Path. She flew through the veiled entrance of the Sunken Temple, and from her perch high above the temple floor, she saw Lenore, curled in a ball by the altar stone. The pyre loomed like a black tower over Squirrel as he raced along the deer paths of the Iron Wood. He’d grown up hunting with his uncles and grandfather, and now his survival depended on those paths. His cousin’s sword bounced painfully against his legs as he caught sight of his uncle through the branches. Up ahead, the men came to a full stop at a clearing in the trees. Squirrel and his uncle caught up with them. Kipp started, “What are you—?” The rest died in his throat as he saw the Gray Monk, with the strange tear-marked eyes, waiting for them in the tall grass like a sun-dappled wraith. His courser grazed nearby. The wood grew quiet. The monk did not move. Squirrel could smell the sweat of the men turn sour with fear. These were not warriors. They were carpenters and the sons of bakers. Squirrel’s uncle was the only one of them who had killed with steel, but that was years ago, defending his family against Viking raiders. But if his uncle was afraid, he did not show it. They were, in fact, eight. Squirrel’s uncle had forgotten to include him. The others drew their swords with a single shining sound. Squirrel swallowed as he tried to lift his own sword, though he stayed a step behind the men who encircled the Gray Monk. The monk calmly drew his gleaming blade. One of the men, Tenjen, angled himself directly behind the monk, switching sword hands to wipe his sweaty palms on his smock. The monk held his sword low and loose on his left side. He tilted his head slightly as Tenjen shifted his weight from one foot to the other. Squirrel’s temples throbbed with tension. He watched the others huff and rev themselves for battle while the monk’s breathing never changed. Tenjen roared and lunged, but the Gray Monk smoothly pivoted away from the strike and in the same fluid motion stepped backward into Tenjen’s path. Squirrel never saw the monk’s sword move until it stuck out of Tenjen’s back, slick with his blood. With a wet sound, the monk freed his sword, and Tenjen pitched forward into the dirt. On instinct, Squirrel lifted his sword, but his mind was blank. A terrible buzzing filled his ears. His tongue was cat dry. The men’s screams were distant and their movements slowed as their swords swung and the monk spun inside their circle, his robes swirling, his blade catching the sun. He wasted nary an inch. His sword struck like a snake and men crumpled in its wake. He cut the tendons in the backs of their legs so they dropped like puppets, then severed throats and punctured hearts. There was no hacking, no cuts, no grazes, no fumbles of any kind. Ewan, the baker’s son, fell onto his knees, trying to hold the blood inside his opened throat with both of his hands. Those same hands had drizzled honey over the crispels in his father’s kitchen. Drof the butcher missed badly, lodging his sword in the earth. He struggled to free it, which was all the time the monk needed to crouch low and launch upward, lifting Drof off his feet, pushing the blade through his body and out his right shoulder blade. Squirrel’s uncle was the first to block one of the monk’s strikes. Kipp caught his blade with the hilt. Their steel scraped as their shoulders slammed together. For a split second, the monk was caught up and his flank exposed. Squirrel saw a window to act. He stepped forward to protect his uncle, but Hurst, Tenjen’s cousin, also saw the opportunity to strike and lunged ahead of Squirrel. The monk must have sensed his approach, because he wrapped his arms around Kipp and turned him into the path of Hurst’s sword, which sank deep into his hip. As Kipp cried out and clutched at his side, the monk whipped around and lopped off Hurst’s head. A mist of blood sprayed Squirrel’s cheeks. Kipp stood his ground bravely as blood dribbled down his left leg. The monk circled him, moving fast. Kipp tried to follow him with the point of his sword. The monk feinted twice, Kipp bit on the second, and that was it. The monk stuck him through the chest, and he folded to the ground. “Don’t!” That was all Squirrel could say. The monk barely tilted his head toward the word. He whirled around and…hesitated. Squirrel could hear the vibration of the blade beside his ear. His hands trembled as he pointed his cousin’s sword at the monk. Squirrel could not see the monk’s eyes beneath his deep gray cowl, only his strange tear birthmarks and a smear of blood on his left cheek. With a swift flick, the monk sent Squirrel’s sword spiraling into the trees. Squirrel squeezed his eyes shut and tensed his body for the blow, which he prayed would be clean. After a few labored breaths, Squirrel opened one eye. Nimue ran down the winding stairs, along the impassive faces of the sculpted walls, until she reached the cracked marble floor. Lenore lay crumpled near the altar stone, her robes wet with blood. Several feet away, a dying paladin writhed on the ground in a puddle of blood. “Mother!” Nimue collapsed by her mother’s body. “Mother, I’m here.” Nimue took her mother’s head into her lap, revealing a bloody dagger beneath her. She was curled around something wrapped in sackcloth and tied with rope. A large stone had been removed from beneath the altar, revealing what had been a hidden resting place for whatever this was. But before Lenore could answer, a paladin with sallow cheeks entered the temple, blood dripping from his sword. Nimue managed to take a few steps toward the stairs, and the Red Paladin moved to block her. His dull black eyes flicked between Nimue and Lenore. Lenore was pale and unsteady from loss of blood, but she advanced on the paladin. Lenore looked at her daughter with eyes filled with love and remorse. “I love you. I’m sorry this falls to you. You must find Merlin.” At this she turned and lunged at the Red Paladin with the dagger, giving Nimue a second to escape. Through eyes blurred with tears, Nimue clawed up the pathway of the Sunken Temple, fighting the impulse to look back, wishing herself deaf to the sounds of struggle below. Clutching the bundle under her arm, she staggered through the veil of ivy and into the Iron Wood. She ran to the lookout where, just a morning before, she and Squirrel had laughed and wrestled. From here all of Dewdenn unfurled before her. She saw the hill of burning crosses and paladins on horseback charging across the field from the east to cut off those attempting to escape. At the bottom of the hill, another group of paladins freed huge black wolves from their leashes and set them after the remaining villagers. Nimue spun around and raced back into the forest, praying to the Old Gods of the Sky Folk to guide her.